The Water Unit is recommended for use in ponds, lakes, retention areas and any waterway where unwanted geese are a problem. This floating unit features an amber 360-degree solar-powered LED light that flashes every two seconds, from dusk to dawn, year-round. The light is mounted on a base comprised of ¼ inch thick ABS black plastic that is configured completely in a one-piece design so there are no seams or points of weakness. It will never fade, crack, or need to be replaced. The base is specially designed to effectively displace water and maximize its stability, despite any strong winds and possible choppy waters. Boat hulls informed the shape and ratios of the base design; we have never had a report of one tipping over. 5 pounds of added ballast keeps the unit weighted and a built-in eyebolt is used to keep it localized when tethered to a cinder block. With a recommended 10 feet of slack in the line, the unit is able to float in a small circular area, when moved by wind or current. This movement adds an additional level of deterrence for the geese. NOTE: a cinder block and a tether rope are required for installation, but are not included. The Water Unit’s light is scarcely noticeable to humans but is very disruptive to the sleep of the geese: it is directly at their eye level, and is annoying to their incredibly sensitive eyesight. Geese choose to sleep in locations that feel safe to them, in which they are free of threats from predators while they rest. The safety in the water is why they choose lakes, ponds and other waterways for sleep and/or rest at night. The light causes them to no longer feel secure at night in the water. Because geese prefer to sleep and eat in the same area, they will no longer find the adjacent grassy area attractive during the day either, and will leave to find another habitat, usually after just a few restless nights. To humans, this light is very dim: in 10 years, no one has ever complained about it bothering them. 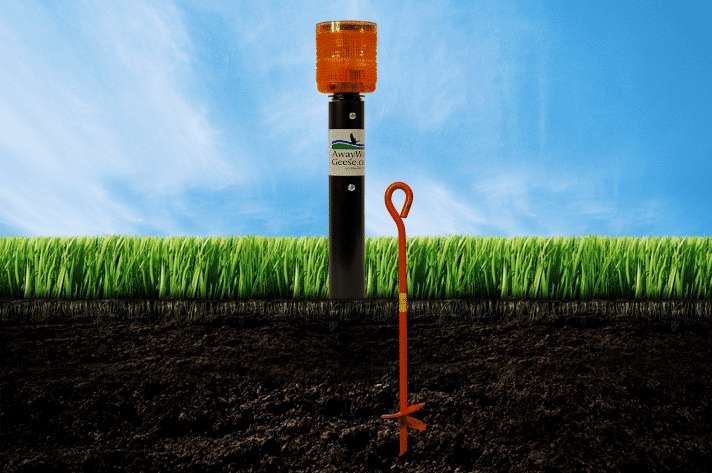 The Water Unit has a 75-yard effective radius and is incredibly effective at deterring geese as it flashed light while also moving with the water. It is maintenance free, satisfaction guaranteed, and comes with a two-year parts warranty. Fill out our short, free Placement Study for our professional recommendation of the type and number of units, and their most effective placement for your property, via email.